Emily on the road with Reggie while training! After spending a year in Vermont, first interning at a small beef and vegetable farm, and then farming at The University of Vermont Catamount Educational Farm, I saw firsthand the disconnect between the undereducated American consumer and the overworked American farmer. Passionate about combating this issue, among others, through agricultural and environmental education, I decided to broaden my own education in both fields and see what was going on in the food systems world outside of the farm-to-plate state. I was searching for my next adventure, one where I could stay educated on where my food is coming from and provide others with the same opportunity. That’s when I found Lovin’! Although I was born and raised in New Jersey, my experiences and time spent in Vermont throughout most of my life very much shaped who I am today. Vermont introduced me to a life in the country: hearty farm to table meals, dairy cows, farmer’s markets, the beef industry, county fairs, cold winters, endless summers and fierce friends. My family’s favorite restaurants are in Vermont, and not all, but many of my best food memories are from times that I’ve spent in Vermont. Vermont has heavily cultivated my deeper connection to and interest in food, from seed to market, from farm to table and all the memories made and lessons learned from those times in between. A season growing food in Vermont indirectly led me to food rescue. During that growing season, I learned about the concept of “the ugly vegetable.” I was surprised at how many vegetables our farm tossed into a seconds bin or composted each week. 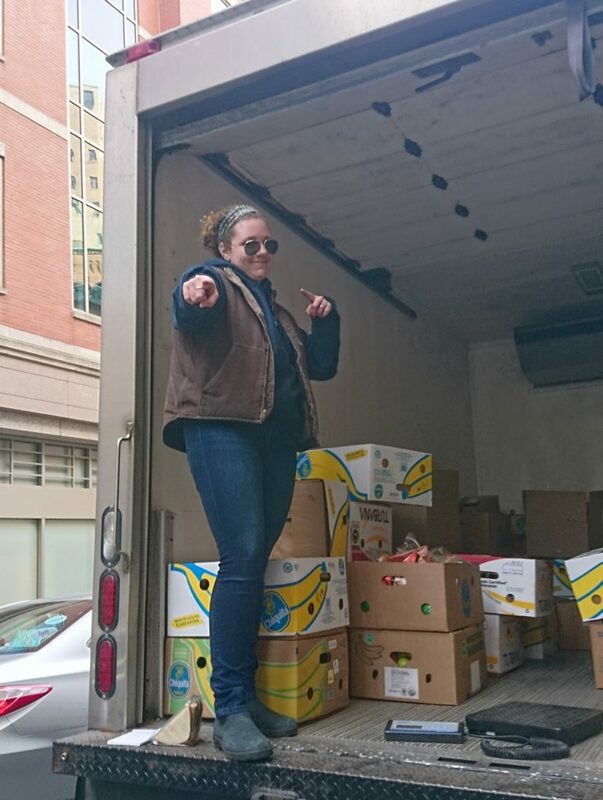 I also saw that when food donations were not thoughtfully coordinated food shelves or shelters could become inundated and overwhelmed with a surplus of produce in addition to their regular surplus of government funded non-perishables (of low nutritional value). As a result, some of this food was thrown away again. So, just moving food around doesn’t solve the problem. We need consistent communication and coordination between donators and those receiving the donations. To me, when I go out and rescue food everyday, it is about way more than simply tackling the staggering amount of food that we waste. It is about building relationships, creating community, sharing a common goal or simply making someone’s day when you show up with a box of fresh greens and beautiful looking broccoli. I love a hard day’s work spent working alongside others that leaves you a little sore, tired (maybe sunburnt) but satisfied and filled with gratitude, forming solid relationships, and sharing food, conversation (and maybe even some music). I am also grateful to experience a side of the food industry that most people never think about when they walk into their local grocery store, let alone will ever see. Yes! Within one week on the road, I could not help but notice the endless bounty of bakery sweets and breads that vendors donate to our cause. The volume of baked goods our vendors collectively give parallels an undeniable rise in the number of American consumers who are shifting to gluten, lactose or sugar-free lifestyles. This makes me realize how much bread and other baked goods would be wasted if we didn’t retrieve them. At the same time, many of our beneficiaries request these items so the demand is there. Definitely! As a cook, I make a superb turkey chili. As a baker, I am best known for my Irish soda bread, biscotti, lemon cookies and apple or triple berry pies. The first supper of Spag (spaghetti and meat sauce) and Congo bars on the dining porch of my summer camp in Vermont. The volume was incredible, the excitement uncontrollable, and the energy, simply contagious. We had the whole summer ahead of us in this irreplaceable, soulful community, and every summer, per tradition, we began another season with the same meal, slightly cramped, but all together, nestled in a little valley in the heart of the Green Mountains, under the same faded tin roof of the Main House.